Hunter is a progressive British heritage brand renowned for its iconic Original Rubber Wellington Boots. Built on the philosophy of protection, intelligence and craftsmanship, their products look to Hunter's heritage of pioneering design to create advanced boots, clothing and accessories for those who require excellence in all weathers and landscapes. With Big Apple Buddy’s personal shopping service, you can now buy direct from the Hunter online store anytime, anywhere. 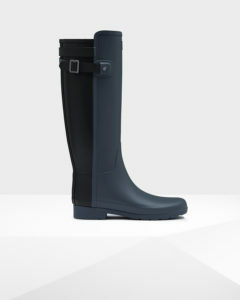 The Hunter Women's Original Refined Back Strap Rain Boots are a new design, inspired by the iconic Original Hunter boot. The reduction of the curved toe and extension of the top front create a more tailored, modern shape. A slim fit leg features a contrast tone back, with strap and buckle details and a molded sole for a more classic look. The Hunter Women’s Original Utility Parka is a classic, well designed piece, crafted from two-layer cotton, with a waterproof and breathable membrane. 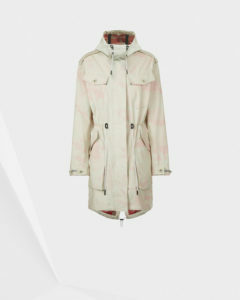 The inside of the jacket reveals a subtle pink camo pattern that adds a pop of color to the beige tonnes. Matching boots are also available from the US Hunter online store. 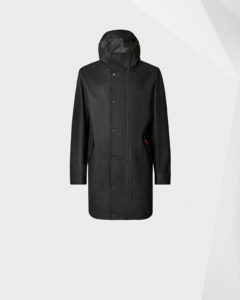 The iconic Hunter Men's Original Rubberized Hunting Coat is crafted from knitted polyester, with a rubber-touch coating and welded seams for full wind and waterproofing. This fully waterproof raincoat also features sports mesh lining for added comfort and a back storm flap. Pair this with Hunter rain boots to have the ultimate waterproof outfit. Unfortunately, the USA Hunter online store does not currently offer international shipping. However, Big Apple Buddy, your personal shopper, can help you buy products direct from the official USA Hunter online store and ship them to your doorstep, no matter where you are in the world. We offer international shipping to over 190 countries including Australia, Austria, Bahrain, Belgium, Bosnia & Herzegovnia, Brazil, Brunei, Canada, China, Croatia, Cyprus, Denmark, Estonia, Finland, France, Germany, Hong Kong, Hungary, India, Indonesia, Ireland, Israel, Italy, Japan, Kenya, Kuwait, Lithuania, Luxembourg, Macau, Malaysia, Maldives, Mexico, Namibia, Netherlands, New Zealand, Norway, Oman, Pakistan, Philippines, Portugal, Saudi Arabia, Scotland, Serbia, Singapore, Slovenia, South Africa, South Korea, Spain, Sri Lanka, Sweden, Switzerland, Taiwan, Tanzania, Thailand, UAE, UK and Ukraine. If you would like to buy from the USA Hunter online store, simply let us know which items you would like to order (by filling out the form on the right) and we’ll get back to you with a free international shipping quote within 24 hours!